Bowling Green moved back into the top 10 of this week’s U.S. College Hockey Online Top 20 and the USA Today/USA Hockey Magazine Top 15. 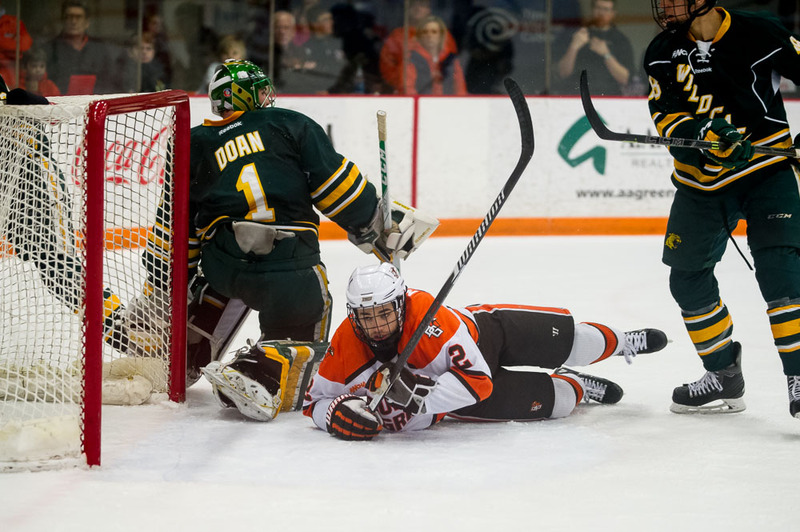 The Falcons improved to 23-10-5 overall with a 3-2 (overtime), 4-1 sweep of Northern Michigan in the first round of the Western Collegiate Hockey Association playoffs at the Ice Arena. BG was 13th in both polls last week. In the USCHO voting, the Falcons received 531 points, up from 412 a week ago. In the USA Today, the Falcons received 213 points, up from 116 a week ago. This is the sixth week this season the Falcons have been in the top 10 of both polls, but the first since Feb. 16. BG has been as high as sixth in both polls this season. NEXT: The Falcons will face Michigan Tech, 28-8-2 and ranked fourth in both polls, in the WCHA Final Five Friday at the Xcel Energy Center in St. Paul, Minn. Faceoff is at 5;07 p.m. Second-ranked Minnesota State (27-7-3) plays Ferris State (17-19-2) in the other semifinal at 8:37 p.m. The winners return Saturday night at 7:07 to play for the championship and the WCHA’s automatic berth in the NCAA playoffs. TV: According to SportsTime Ohio, the channel will televise the BG-Tech game live . Fox Sports Net North will show all three games live.